No post today. I spent the weekend helping out my friend Lynda at the Mystery Writers of America Midwest Chapter booth at Printers Row and it pretty much wore me out. Even though it was cold and rainy most of the time, the event was a success and it was actually kind of fun. The star of the show was this dog that poked its head out Saturday afternoon and looked longingly out at the scene below. 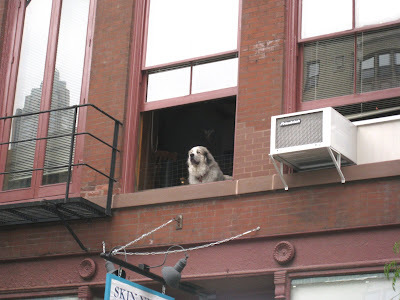 He never barked or made a sound, but it was obvious that he wanted to come down and join the fun. He would have been most welcome. I think it was the singer crooning mostly French songs across the way that drew him out. I was going to write a scathing complaint about him, singing pretty much the same rotation of songs over the two-day period at an annoyingly loud volume, but after we asked him to tone it down Sunday morning it was actually quite pleasant, and every once in a while he would throw something new into the mix. But if I hear "La Vie en Rose" one more time for at least the next five years I am not responsible for the consequences. Not his fault - the music wasn't meant for those of us who were stuck there the whole time, but we suffered nonetheless. His name is Michelet Innocent and he had a beautiful voice. Stupid internet, I wrote something and it wouldn't take it. Thanks again for coming and saving me from an endless, dull weekend. I am stealing your picture of our friend the dog. It was my pleasure. I enjoyed catching up.